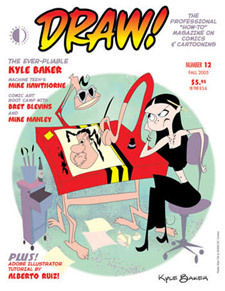 Devout comic book aficionados will immediately recognize Kyle Baker’s name from his various high-profile projects over the years, including his take on Plastic Man, “Truth: Red, White and Black,” the story of the African-American man on whom the Super Soldier Serum (the chemical which gave Captain America his powers) was originally tested, and his own creations, such as “Why I Hate Saturn.” Bullz-Eye had the opportunity to chat with Baker about his latest collaboration, which finds him teaming up with the folks at Vector City Racers to compose a comic book which works in connection with their interactive online game, but we also got his take on the resurgence of Plastic Man since he tackled the character, found out how he came to appear in a George Clinton video, and learned the now-laughable reason why his graphic novel “Birth of a Nation” was originally rejected as a movie. Nique Fajors: Will, howdy, this is Nique Fajors. I’m the EVP at Vector Entertainment and more importantly, Kyle Baker. NF: Thanks for being able to accommodate us! NF: We’re kicking off the Vector City Races comic book, and Kyle has been here for several days. He was planning on being in L.A. to do some things today, and then late last night we sort of figured out that he wasn’t going to be in L.A., so I called the Special Ops guys and said, “Hey, any chance we could get a quick interview or two with Kyle here in our offices?” So we appreciate a site of your quality and traffic level being able to accommodate us. BE: Oh, yeah, absolutely. I’m a fan of Kyle’s work…and, fortunately, I didn’t have anything to work around today. So, Kyle, how did you come to be involved with the whole Vector City Races project? "Right now, I think that ('Vector City Racers') has so many great elements that my job in writing the story is that you want to be able to read the comic and learn about these characters and see this world, and then live out the fantasy by going into this world and being able to do the same thing." 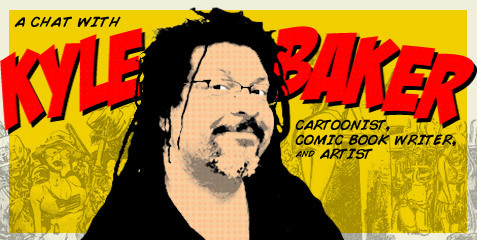 KB: Well, I’ve been doing comic books for 25 years now, for Marvel and DC and everybody else. I had met Nique a few years ago because he was a working at Atari, and he was interested in a comic I had done based on the Turner Rebellion, called “Nat Turner.” That intrigued him and we’ve been looking for something to do for years. We talked again when he was over at Capcom and finally we found something that we could do together. NF: Yeah, and you know it’s interesting, because it’s very much one of those cases where the comic can really benefit from having this whole virtual world and game element built right out of it. And then it’s very much my view that the virtual world and game could benefit from some more traditional entertainment. I think one of the strengths of virtual world is that the kids sort of create their own experience, but I think there is a pretty big opportunity to present sort of more traditional entertainment and create real story and motivation and context for the kids that, frankly, could best be done with a comic. KB: That was the other reason I was really interested in this project. I have four kids, and I can see how much time they spend on these virtual worlds now, and I said, “I’ve got to get in on this.” They like that more than they like the comic. BE: When it came to creating the comic, did you get to play the game first, so you had a personal frame of reference? KB: Yeah, yeah. I’ve been actually following the game through its development, so I’ve seen it get better over the last few months. NF: And, Will, we actually just went to open beta on Monday and implemented a lot of new stuff. We’ve actually got what we call The Vector Zone, which is a store where you can buy engines and transmissions and tires. We’ve got this thing called The Mod Shop, where you actually create your vehicle. You know, I think one of the other things that Kyle loves about what we’re doing is, you know, people talk about personalization. 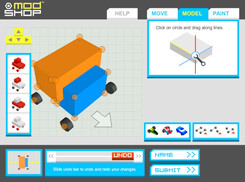 When you go into our Mod Shop, you start with two 3-dimensional cubes. Kids have made motorcycles, trucks and cars, of course, but they have also made toothbrushes with wheels. They have made ice cream sandwiches with wheels. They have made X-wing fighters. It allows the child, in terms of their own creativity, to go any place they want to go. BE: So, Kyle, the items that you put in the comic book, can they be incorporated into the game in the future? NF: The other thing that we’re doing, Will, is that the majority of vehicles that Kyle uniquely creates in the comic book will be available in the game as exclusive unlockables. And we’ll build them in such a way that you couldn’t actually recreate them using the Mod Shop. So there will be a level of exclusivity that is exclusively tied back to the comic. And then, of course, we’re going to do all the things like having codes in the comic book that unlock certain things in the game. Having clues in the game that link back to solving story puzzles within the comic book. BE: Okay, cool. Well, out of the existing stuff, Kyle, what was the most fun for you to expand upon within the comic book? KB: Well, right now, you’ve got that whole world, and things are knocking down buildings and, you know, customizing the car thing is what I really like. What I like right now is that there were no characters yet, so that part was wide open. You know, like I said before, when you think about Super Mario, it’s got to be about Super Mario, whereas with this, we don’t know who the Vector City racers are yet. We’ve just got this great world, and these cars and goals and obstacles, and all that stuff. And the half pipes and the stunts that you can do, and we’ve got to make up some kids who do that. That’s what I like about it. BE: So what style art are you using for this? Is it more “Plastic Man,” or is it more “Truth”? KB: We’re still working that out. Not even like “Truth,” though. I’ve been doing, if you search online, you’ll see a recent Hawkman job I did. I’ve been doing a lot of 3D and heavily photo referenced stuff. I’ve found that the comic book fans…the last few years, I really did a lot of experimental stuff, and I’m trying to push the envelope. I’ve decided just recently to sort of play it a little safer. I know that people tend to like the more realistic art like Alex Ross and things like that. KB: So the most recent jobs I’ve been doing are more along those lines. So we’re looking at doing that with a little bit more anime influence, because my kids…I use my kids as a focus group, and they really like that anime style. BE: I wanted to ask about a couple of the other comics you have worked on over the years, if you don’t mind. BE: Working on The Amazing Adventures of the Escapist, how did you fall into that? Is that something that you actively pursued or did they come to you? KB: No, that was something that Michael Chabon had created and he’s a bit of a comic book fan. He created “Kavalier and Clay.” So he had a list of creators that he wanted to work with. That was a lot of fun. I like collaborating with people because, you know, I tend to work alone, and it gets lonely. So any time I can open myself to new influences like a video game or working with a famous novelist, it brings something new to the element. It brings something new so that I’m not repeating myself all the time, also. BE: When you originally approached Plastic Man, were you looking in terms of following in Jack Cole’s footsteps, or did you have your own vision in mind? KB: Yeah, yeah. What I often do when working with a pre-existing property, like Plastic Man, and I worked on Bugs Bunny also around the same time, is…you’re dealing with characters that used to work and have fallen out of favor, and usually it’s because they have gone so far off of the original formula that the easiest thing to do is just try to bring it back to what it used to be. Plastic Man used to be a humorous detective story, and it’s just as they integrated it more into the DC universe over the last couple of years that it has gotten more dark and depressed, you know, in the wake of Alan Moore and Frank Miller. It just got darker and more depressing, which is fine for some of these characters, but the characters like Plastic Man and Shazam, which were originally humor titles, they haven’t made the transition so well. So that’s why I said, “Let’s just bring Plastic Man back to what used to work.” And the other thing was that everybody seems to have forgotten the simple fact that what made Plastic Man interesting was that he could turn into things. You know, there seemed to be…and again, the pendulum swings both ways…but at the time I was working on it, there was this trend in comic books of superheroes not using their powers. You know, like, you would read an entire issue of “Green Arrow” and he wouldn’t shoot an arrow. You’re just wondering, “Why is this guy dressed like Robin Hood?” Because everybody got so heavy into the Watchmen, it was, “Let’s sit around and talk about our problems.” I’ve seen entire issues of “Superman” or “Justice League” where they don’t fight anybody; they just stand around talking about their problem. When it works, it works. You know, I can’t fault them for doing something like that when people are buying the book. But on the other hand, if you’ve got a character named Plastic Man, let’s turn him into something. BE: You know, they’re releasing the “Plastic Man Comedy Adventure Show” on DVD very soon, where he very much turned into things. BE: As well you should I think. Were you surprised to win an Eisner Award for the “Superman’s Babysitter” story? "I’ve seen entire issues of 'Superman' or 'Justice League' where they don’t fight anybody; they just stand around talking about their problem. When it works, it works. You know, I can’t fault them for doing something like that when people are buying the book. But on the other hand, if you’ve got a character named Plastic Man, let’s turn him into something." KB: That was a really funny joke. Yeah, that was all Frank Miller’s doing. He was the one who started that campaign, because the book had been rejected and pulled. So Frank had nominated it in his “Sin City” letters column, if I remember correctly. Or “300.” One of his books. That’s what started the whole campaign. That also was the first…you know, because this was a few years ago, it was my first education in the power of the internet. You had a book that had not been released at all, and it was totally read by being leaked to the internet. NF: I didn’t know that story. You had told me about writing it, but I didn’t know you ended up getting an award. KB: Yeah, yeah. And that’s what ended up getting the book actually printed. They ended up creating a book called Bizzaro Comics, a hardcover which was basically built around this one story. BE: How did you end up in a George Clinton video? I saw that on your blog. KB: Oh, yeah. I guess that’s because I agreed to work for free. (Laughs) I was friends with the director, and…wait, that’s on my blog? Oh, yeah, that’s right: we found it on YouTube. KB: The director was a guy named Reginald Hudlin, who did “House Party.” I do a lot of work with him. Like I said, I guess he needed extras, and I happened to have long hair and was willing to work for free. It was good because I ended up making a lot of friends. I still hang out with Parliament. BE: Actually, speaking of Reginald Hudlin, has there ever been any talk of making an animated film out of “Birth of a Nation”? KB: I keep after him. He and…I don’t know if this is gossip or not, but he and…oh, gosh, I’m blanking on the guy’s name. Who’s the “Boondocks” guy? KB: Aaron, sorry. Yeah, he and Aaron had a falling out when they were working on the TV show together. But it was originally created as a movie, but they couldn’t get it set up because, at the time, no one was interested in a story about a black president, it being too far fetched. (Laughs) So we have to kind of convince them. Maybe I’ll be the peace keeper. Maybe I’ll be the Obama and bring the two sides of the aisle together, because that’s a good story. BE: Absolutely. 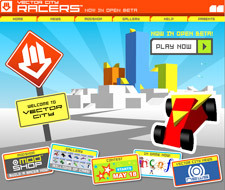 Okay, I’ll bring it back to Vector City Racers. I know you said you have played the game, but have your kids played the game yet? KB: My daughter has. Yes, she’s the oldest one; she is ten. The other ones are pretty young. BE: And how did she adapt to it? Because I have a daughter as well, so I’m just curious. KB: She enjoyed it. She spends a lot of time…most of her time…playing online games. A lot of the decisions I make, for better or for worse, are based on wanting to reach my kids. You know, that’s why Plastic Man was a kid’s book. NF: One of the things that we’ve seen, Will, is that, although we’ve targeted the game to very much the way boys play online games, in that there is measureable achievement, competition and personalization, socialization is important but it’s secondary. Boys are not going to sit in a street and just sort of chat in their cars as a lot of girls do in Club Penguin and Webkinz and so forth. But what we found is that girls in particular love the personalization element. KB: Yeah, they are attracted to building cars. BE: Excellent. I think that’s about it on my end, but since I didn’t have too much lead time to research, is there anything that either of you wanted to add? NF: You know, Kyle, maybe it’s worth giving a brief overview on kind of the way the stories are going to play out. I think it’s kind of neat in terms of Vector City…he talked about the need to create that context to the story. But he’s actually, in a fairly short order, created I think a kind of fun context for what this is. KB: Sure, okay. Each story is going to follow the same basic formula: it starts in a classroom, and some kid in that classroom is a Vector City Racer, but you don’t know who. We’re playing up the whole secret identity thing that you see in superhero stories, and like Power Rangers and stuff. So some kid…and it will be a different kid every time, and it will be a different classroom every time… will get a phone call on his cell phone, saying, “Vector City needs you; we have a mission for you.” So the kid has to figure out how to sneak out of his classroom and then go to some location. And it will be some weird location every time. Like, he has to jump into his own locker or something, and he ends up in Vector City. Then the story follows the same pattern as the game: first he starts in his garage and chooses a vehicle, which he then takes to the Mod Shop and customizes based on where the mission is, because the mission will be in a different section of the Vector City. You know, the Vector City game has different cities in it, like Avalanche City and Earthquake City. So based on where the mission will be, he has to take it to the…what’s the name of the store? KB: The Vector Zone store, where he customizes the car further, adding booster rockets or whatever. In the game, the online currency is called Revs. So if a kid doesn’t have enough Revs in the story, he has to do whatever is necessary, you know, a certain number of tricks or something, within this very limited time frame because he still has a mission to complete. He customizes the car and then finally goes on the mission with a bunch of other kids. No one in Vector City is allowed to reveal their identity, just like online you’re not allowed to reveal your identity. Everybody goes by code names. So there will be some kind of mission that has to be completed within a certain time, and they have to go through all of the obstacles that you have in the game and use all of the various elements like the teleportation devices and the knocking down buildings. That’s my favorite thing to do. And the ramps and the half pipes and stuff. The fun part of the story is that, because you’re doing these missions anonymously, there will be clues that some the kids that you know from your classroom, you know, that the character knows from the classroom, he starts to suspect that others are Vector City Racers. Like, they might say something during the race that tips him off. “Hey, that sounds like something that girl said,” you know. Like, one of the things that they start to realize is that…they start to suspect that the best racer among them is actually this six-year-old girl, but they can’t ask her. If anyone ever reveals their identity, they get thrown out. Each mission has some projected, horrible outcome if they fail. One story would be…and it’s always some real world consequence…that they have to deliver some kind of element to protect a dam from bursting. If they don’t make it in time, the dam is going to burst. And so what we’re talking about now is when you get through that thing, and you make it in time, it will unlock a quick time video that will show…you were asking before about introducing elements that will show up in the game? KB: But because each story is going to have…like, one story would be a princess has been captured, and they have to get the princess. Another one would be they have to stop an alien invasion. And it’s a lot to ask the programmers, “Hey, we’re doing an alien invasion this week, can you come up with an entire alien race?” Instead, we can say, “Just add a new world for us.” So when they hit that goal, it will unlock a QuickTime film, because that’s easier for us to get done quickly. KB: A QuickTime movie showing either the positive or the negative. You know, you’ll either see the dam breaking and the town being destroyed, or the town being rescued. Then the story always comes back to the real world, and we see how the real world has changed as a result. BE: Now, see, I’m all ready for an animated series. NF: That’s absolutely what we’re looking for. (Laughs) You nailed it. And timing wise, it will be ready for back to school. KB: And, of course, everybody’s grades will drop because they’ll be playing this game. BE: Perfect. (Laughs) Well, I’m glad I was able to hook up with y’all. It’s been a pleasure talking to both of you. NF: Thanks a lot, Will.